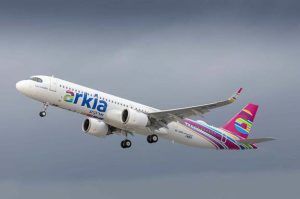 Tel Aviv based ARKIA Israeli Airlines which is majority owned by Jordache Enterprises, has taken delivery of its first A321LR becoming the launch operator of the world’s most flexible and capable large single aisle aircraft ever. The A321LR is the latest version of the best-selling A321 Family and allows operators the flexibility to fly Long Range (LR) operations of up to 4,000nm (7,400km) and to tap into new long haul markets, which were not previously accessible with single aisle aircraft. The new LR cabin configuration allows airlines to offer each passenger more space and premium products for widebody comfort. The A321LR and its derivative aircraft family members are the world’s best-selling single aisle aircraft with over 6,100 orders from 100 customers since its launch in 2010. It has pioneered and incorporated the latest technologies, including its new generation engines and the industry’s reference cabin design, delivering 20 percent fuel cost savings alone. The A320neo also offers significant environmental benefits with nearly 50 percent reduction in noise footprint compared to previous generation aircraft. Powered by Leap CFM motors, Arkia’s A321LR fleet will be configured with 220 seats in a single class layout.